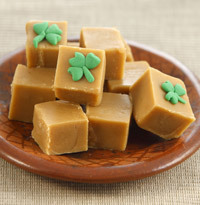 Irish Recipes for St. Patrick's Day ! Preheat the oven to 220°C/fan oven 200°C/Gas mark 7. Season the beef ribs with salt and freshly ground black pepper and dust with the flour. Place them in a roasting tray with the onion, celery and carrot and roast for 20 minutes, then turn the short ribs over and roast for a further 15 minutes. When cooked, transfer the vegetables and ribs to a heavy-bottomed saucepan or casserole dish, leaving the fat and juices behind, and set aside. Put the roasting tray with the fat and juices over a low heat. Add the tomato purée and cook for a minute, stirring. Gradually add the stout and beef stock, whisking well until smooth and incorporating all the lovely caramelised bits from the bottom of the roasting tin. Bring to the boil. 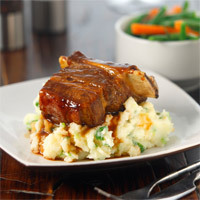 Pour the gravy over the short ribs and vegetables and place over a medium heat. Add the bay leaf, thyme, garlic and peppercorns. Season with salt and freshly ground black pepper and cover. Bring to the boil, then simmer gently for 2-2½ hours, or until the meat is tender: it should be almost falling off the bone without being too soft. Fifteen minutes before the ribs have finished cooking, cook the potatoes in lightly salted boiling water. Remove the short ribs and keep warm. Bring the gravy to the boil and cook for about 10 minutes until reduced by a third. Season to taste. Drain the potatoes. Melt the butter in the saucepan and add the spring onions and saute for 1 minute. Add the potatoes and mash. Add as much warm milk to make a soft light mixture. Season to taste. Spoon the champ onto warmed serving plates. Arrange the short rib standing up pushed into the champ and Strain over the gravy. Serve with buttered fine green beans and carrots. Grease a 7inch/18cm square tin. Place all the ingredients, except the whiskey, into a large non stick saucepan and heat gently stirring until the sugar has dissolved. not simmer and stir for a little longer and try again until a soft ball is formed. Remove the pan from the heat and beat for 5 minutes with a wooden spoon until thickened and slightly grainy. Stir in the whiskey and pour into the prepared tin. Allow to cool. When cold cut into squares. Store in an airtight container for 1 month if it lasts that long! To decorate with the Shamrocks simply roll 50g/2oz green coloured fondant icing (you can buy this all ready coloured in the supermarkets) in your hands until soft and pliable. Pinch off 4 small balls - roll three in balls and flatten slightly and shape into hearts shapes for the petals and arrange on a piece of fudge. Roll the remaining piece into a small sausage shape for the stem and arrange on the top of the fudge to complete the shamrock shape. Press down gently to make it stick. Repeat with the remaining fondant icing. Fruit and nut - make up as above and stir in 75g/3oz mixed fruits and chopped nuts. Chocolate Orange - Make up as above and stir in the grated rind of 1 large orange and 175g/6oz roughly chopped dark, milk or white chocolate. scatter the surface with mini marshmallows , chocolate chips or Smarties. Cook the charlotte potatoes in lightly salted boiling water for 8-10 minutes until just cooked. Drain well and set aside. Bring a large pan of water to the boil. Whisk the water until swirling and then break the eggs one at a time into the water, cook for 1 minute just simmering, then turn off, cover and leave to stand for 4 minutes. Meanwhile heat the oil in a large frying pan and add the bacon pieces and the black pudding and cook for 2 minutes until crispy and make up the butter sauce according to the pack instructions. 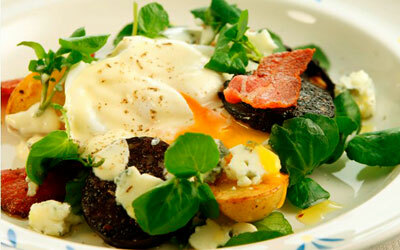 Turn the black pudding and bacon over and cook for a further 2 minutes until crispy. Add the potatoes to the bacon pan and toss. Arrange four pieces of potato, three pieces of bacon and three pieces of black pudding around the outside of a large warmed serving plate. Scatter over some watercress. Lift the eggs from the water and drain on kitchen paper and then arrange in the centre of each plate. Spoon some Hollandaise Butter Sauce over the eggs. Crumble over the cheese and season with salt and freshly ground black pepper. Serve immediately. Buy a corned beef brisket at your local supermarket. In a pot, pour 12 ounces of beer. Add a bay leaf or two, a dried red chile or two, a teaspoon or two of coriander seeds, a teaspoon or two of mustard seeds, a few dashes of cinnamon, a few dashes of allspice, and all the juice from the corned beef pack. Put the corned beef on a steamer rack in the pot and add water to bring the liquid level up to the bottom of the rack. Cover the pot and put it on some heat and bring the liquid to a boil. Steam for several hours (it took me five hours for a 4 lb brisket) until the meat doesn't feel rubbery when you stick a fork in it. Add water or beer or both as needed to keep some liquid in the pot. [I usually steam the corned beef over night. Remove the meat and slice. Remove the steamer rack. Leave all the other stuff in the pot and put in some potatoes and carrots and turnips or whatever. Add water [or MGD!] to cover and boil until the stuff is cooked. Remove all the vegetables and potatoes. [I leave the potatoes, carrots and turnips in.] Put the steamer rack back in and put in some cabbage wedges. Steam them for about five to ten minutes, depending on how crisp or soggy you like cabbage. [I use 15 minutes.] Serve.